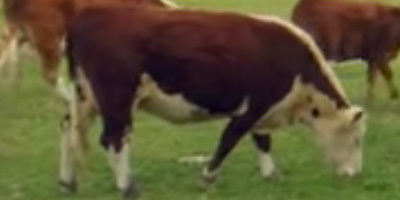 Herefordshire is one of the most rural counties in the country. It is also one of the most sparsely populated. 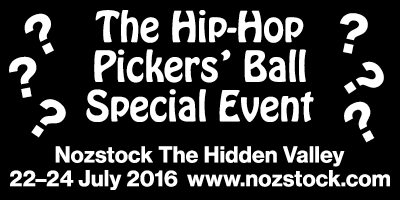 The 2011 Census showed that Herefordshire has a population of 183,500. In contrast, the populations of neighbouring Shropshire and Worcestershire stand at 306,100 and 566,169 respectively. 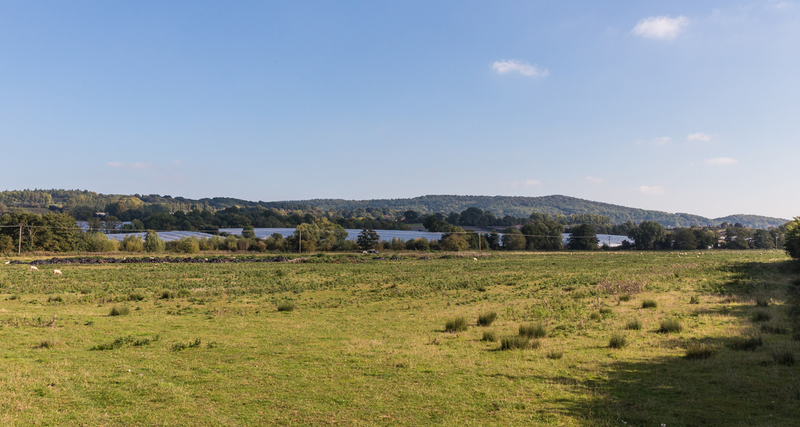 Like any rural county, Herefordshire has an economy and culture directly linked to agriculture; indeed, its landscape is shaped by centuries of agricultural practice. We are accustomed to the rapid change of our urban landscapes and easily accept the demolition and construction so prevalent in our city centres. However, we are not used to our rural landscapes changing quite so quickly. Or changing at all for that matter. Whilst cityscapes represent the ‘new’, the rural embodies how things used to be. We expect our hills, rolling green pastures, streams and meadows to remain as they have always been. This is why HS2 and other major road or rail developments are so controversial: the urban infringing upon the rural is often an irreversible process. 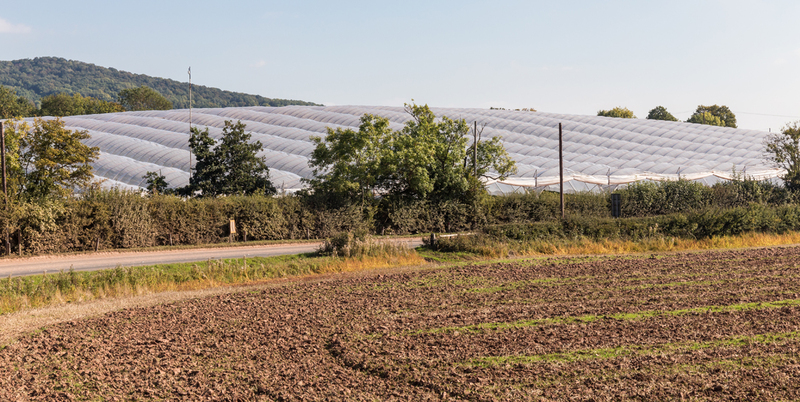 In Herefordshire over the last ten to fifteen years, pockets of landscape have undergone dramatic cosmetic transformation with the introduction of industrial polytunnels, now covering acres of the countryside. Not only have they physically altered the landscape beyond recognition, these polytunnels are political objects. They produce thousands of tonnes of soft fruit for the UK market and, for the thousands of tonnes that need picking, thousands of workers are required. Harvesting soft fruit is labour-intensive as every berry needs to be picked by hand. More often than not, the workers employed to do this are recruited from abroad. Herefordshire, like the agricultural county of Lincolnshire, is a hub for contemporary central European migration to the UK. In Hereford, for example, the Polish community represents the biggest national minority group within the city. The county itself is also the number one destination for Bulgarian workers looking for seasonal employment in the UK. 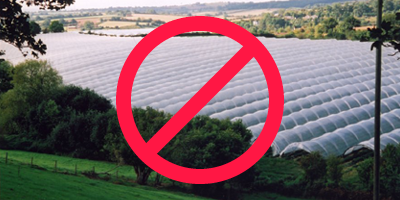 Whilst the complex issues around economic migration are controversial in some quarters, the polytunnels are contentious in Herefordshire because of one other overriding factor: how they look. 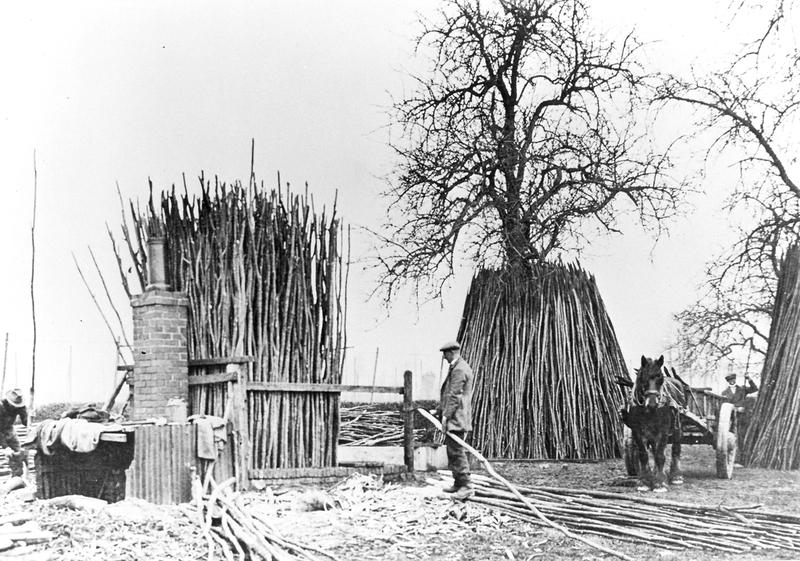 Covering acres of bucolic landscape, many local residents perceive them as an eyesore, a blight on the rural countryside. These structures invoke hostility, particularly if the view from your house encounters one of these. And there are plenty of views to be ruined in the county. Large scale polytunnel growers are now located in the areas of Brierley, Harewood End, How Caple, Kings Caple, Ledbury, Marden, Staunton on Wye and Walford (near Ross on Wye). 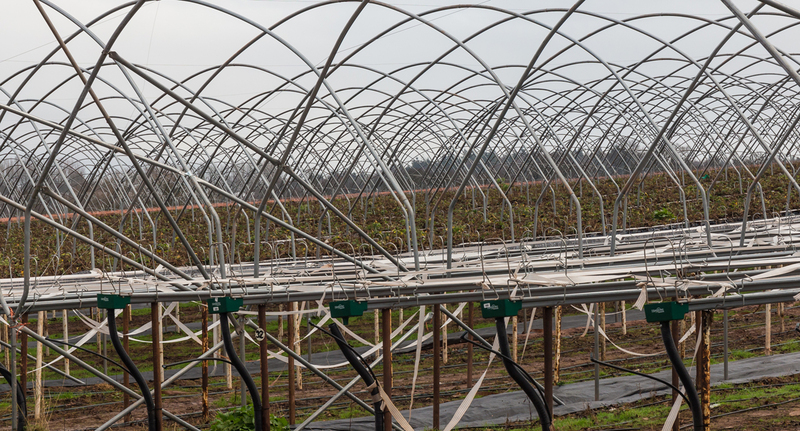 60% of UK soft fruit is grown under these structures; 90% of British strawberries are grown under polytunnels. The British strawberry industry is worth almost £400m a year and now stretches from early spring to late autumn. Polytunnels have extended the fruit-growing season from twelve weeks a year to six months. 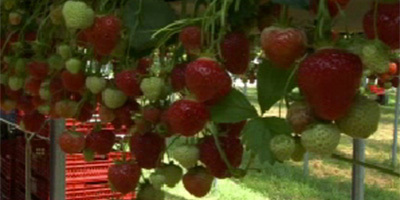 Sales in UK supermarkets of home-grown berries have increased 130% in the last four years. The Campaign to Protect Rural England (CPRE) whose objective is to prevent the countryside from becoming an industrial landscape has campaigned vigorously in Herefordshire to stop these structures from been constructed in ‘protected landscapes’ like the Wye Valley Area of Outstanding Natural Beauty (AONB). 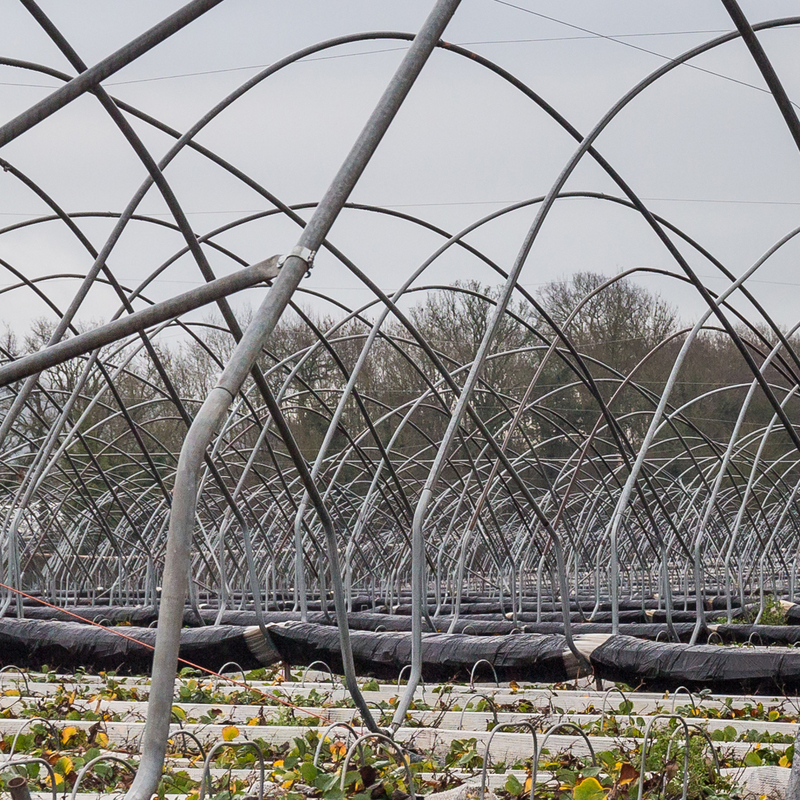 In contrast, organisations such as the National Farmers Union (NFU) argue that the large scale polytunnel growing boosts the rural economy, allows growers to compete with foreign imports and keeps food miles down. 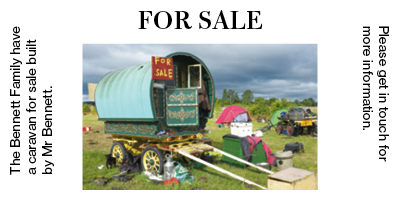 The polarising of opinions on the issue perhaps reflects how the countryside is viewed and used. For the growers, the countryside is a working landscape, a resource to be used, and this means that it is subject to change. It is not just something to look at. Farmers would argue that they are simply doing what they have always done: supplying demand. Glimpsing these polytunnels in the distance, you might mistake them for gigantic shimmering lakes, the water incongruously frozen mid-air in the summer like a vast optical illusion. Up close, these structures loom over the country lanes. 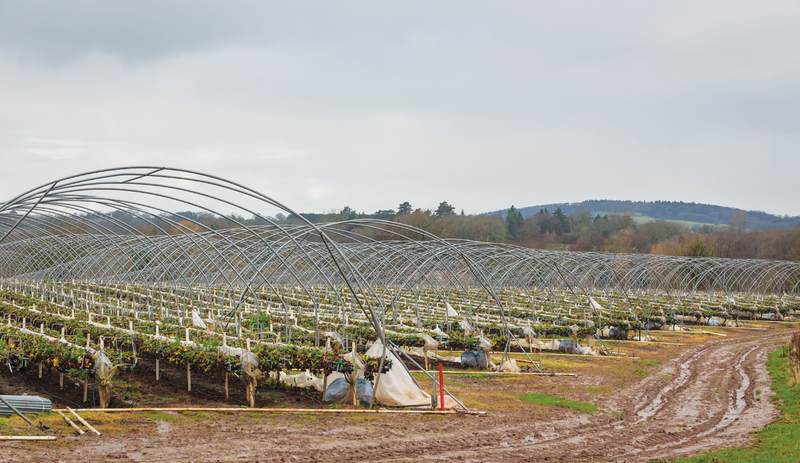 Beneath them, thousands of workers pick strawberries, raspberries and blueberries for the expanded UK market. There is something quite science fiction about them, futuristic even. In the future, will these structures come to dominate the countryside as everything is grown under polytunnels? Will seasons cease to be important as the landscape becomes permanently wrapped in polythene? In southern Spain this has already happened. The small coastal plain of Campo de Dalías, some 30km southwest of the city of Almería, was once the backdrop for spaghetti westerns. It is now a glistening landscape of polythene – a ‘plastic city’. Almería has become Europe’s market garden and to grow food all year, the land is cloaked in plastic. There are now an estimated 135 square miles of greenhouses in the Campo de Dalías, the largest concentration in the world. Over 2.7 million tonnes of produce are grown on the plain each year, accounting for over €1.2 billion in economic activity. From the lens of a satellite, Almería province is one of the most recognisable spots on the planet. The roofs of tens of thousands of tightly packed plastic greenhouses form a blanket of mirrored light beaming into space. This wrapping of the landscape in plastic has parallels in contemporary art. Indeed, we can perhaps think of this manmade aspect of the Herefordshire agricultural landscape as unintentional public sculpture or land art. 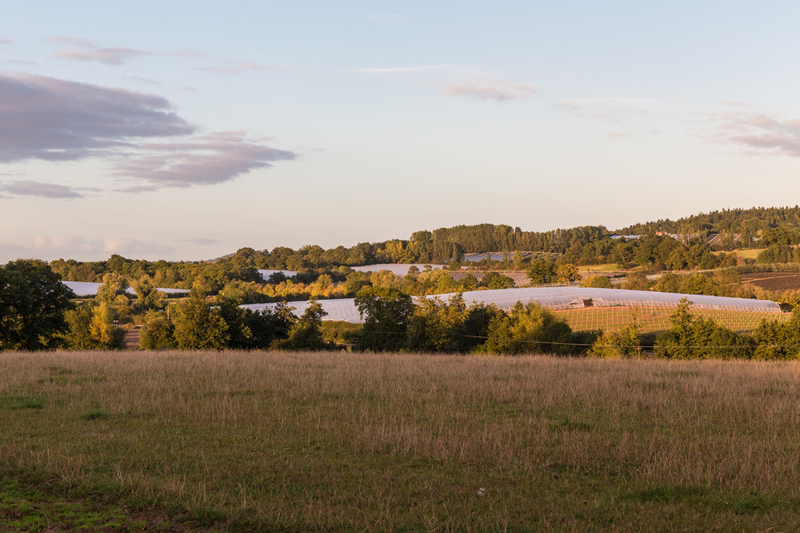 The prevalence of polythene in Herefordshire is such that you might be mistaken for thinking that famous land artist Christo had relocated to rural Herefordshire to surreptitiously continue his work. Christo and his wife Jeanne-Claude (who died in 2009) were an artistic husband-and-wife team who became known for the creation of large scale environmental artworks. Their signature technique was the concealing or ‘wrapping’ of public objects like parks, buildings and entire outdoor landscapes. Their first monumental landscape was created in 1969, on a dramatic stretch of cliff-lined coast in Australia. The artists, together with 125 workers and rock climbers, transformed a mile and a half of coastline by wrapping the entire thing – 85-foot cliffs and all – in fabric, tied down with ropes. The work, ‘Wrapped Coast’, remained on view for ten weeks before the area was returned to its original state. Since then their work has included wrapping in fabric the Reichstag building in Berlin, constructing a 25 mile fabric fence across Northern California and stringing a huge orange curtain across a Colorado valley. And now this quiet wrapping of the Herefordshire landscape. Maybe you’ve seen Christo selling strawberries at Ledbury Farmers Market? Although soft fruits are now grown extensively in Herefordshire, the county is traditionally associated with hop growing. The structures used to grow hops might also be thought of in terms of their agricultural sculptural qualities. Hop plants grow up natural coir string towards a permanent framework of overhead wires, supported by large wooden poles (traditionally sweet chestnut dipped in bitumen). 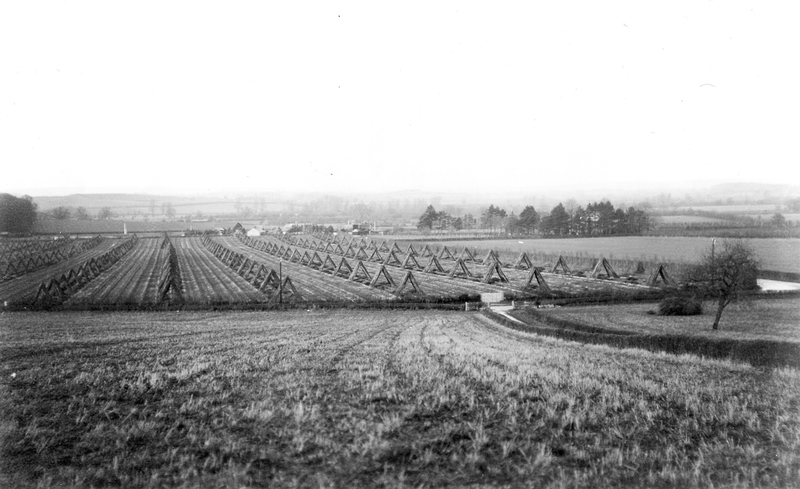 When they were first introduced to the county, hop growing structures – like polytunnels today – may have been equally controversial. 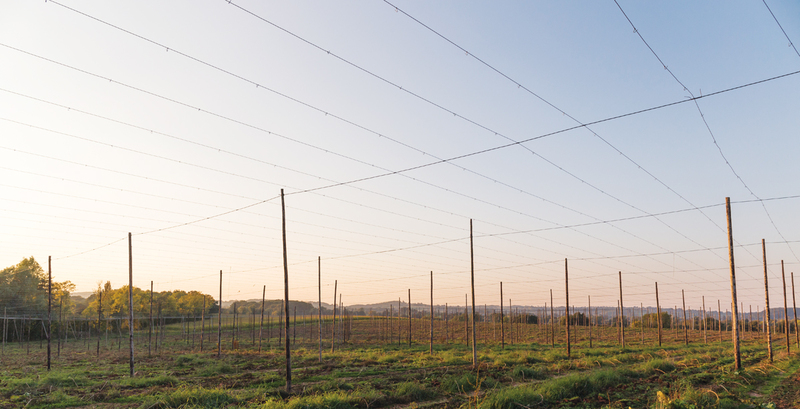 In 1883, for example, hops were grown over 12,371 acres in 81 parishes in Herefordshire. Hop plants grow up to 20 feet in height and require a physically imposing structure to support them, a different wrapping of the landscape. 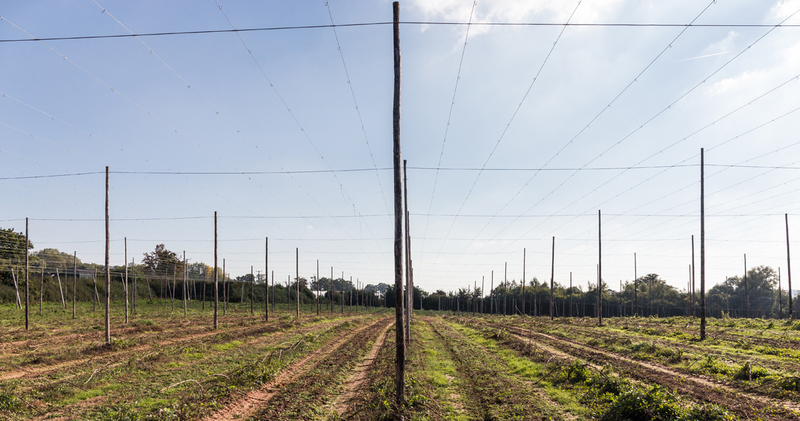 Walking through a hop field during the late autumn and winter months, when they are hop free, the geometric hop pole arrangements recall Walter De Maria’s monumental land artwork ‘The Lightning Field’ (1977). Commissioned and maintained by Dia Art Foundation, ‘The Lightning Field’ is recognised internationally as one of the late 20th century’s most significant works of art. Created in Catron County, New Mexico, it consists of 400 stainless steel poles with solid, pointed tips, arranged in a rectangular 1 mile × 1 kilometre grid. The poles are spaced 220 feet apart and have solid pointed tips that define a horizontal plane. Experiencing ‘The Lightning Field’ does not depend upon the occurrence of lightning (although this often occurs during the months of July and August). Visitors are encouraged to spend as much time as possible in the field, to experience the changes in the quality of light, and the character of the work, from sunrise to sunset.